Do Elite Academic Institutions Make Fewer Football Mistakes? To bury the lede, and by Betteridge’s law of headlines, it appears the answer is no. Now, there are two inherently boneheaded parts of this claim. First, immediately after the commentator gave us this knowledge smackdown, he then discussed how the Stanford defensive back should have batted down the pass rather than intercepted it. With the original line of scrimmage being the 30 yard line and a touchback putting the ball on the 20, the interception yielded a 10 yard loss. In other words, on the same play where Stanford was incapable of making a mental mistake because they are Stanford, Stanford made a mental mistake. Hmm. Second, I would dare say that UCLA is an elite academic institution and they should therefore be immune from making mental mistakes. That being the case, they should have have internalized the fact that Stanford is an elite academic institution incapable of making mistakes and therefore not tried the fake punt. Or did UCLA, an elite academic institution incapable of making mistakes, make a mistake? But I digress. As a friend pointed out to me, this type of inane commentary is nothing new. I know this all to well from living in Buffalo’s TV region and being repeatedly subjected to lectures on how Ryan Fitzpatrick is infallible because he went to Harvard. In any case, the commentators are giving us an answerable question: do elite academic school football teams make fewer mistakes than their…umm…more average brethren? I decided to test this proposition. Of course, there are all sorts of challenges to teasing out relationship. I cannot hope to give a comprehensive analysis in a single blog post. I can, however, give a first-cut answer using readily available data. There are two obstacles standing in our way. First, what is an elite academic institution? Fortunately, university rankings has to be a million dollar industry. There simply is no shortage of them. I chose to look at US News and World Report’s rankings this time. Yes, these rankings are horribly flawed for a number of reasons. Yes, you may prefer Washington Monthly’s system. But USNWR’s rankings are the standard bearer that all other rankings are compared to. 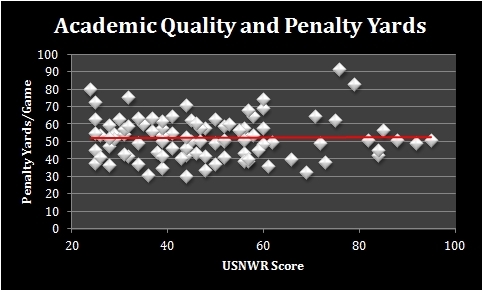 I can thus measure academic quality by using USNWR’s cardinal score. Note the score is different from the ranking and captures how much better one school (allegedly) is than another. There are a couple of important caveats here. First, USNWR features a wide variety of lists. To keep from comparing apples to oranges, I am only looking at schools on the national university surveys. Regional schools, liberal arts schools, and military schools that nevertheless have FBS programs are thus excluded. (I’m only looking at FBS schools, again to compare apples to apples.) 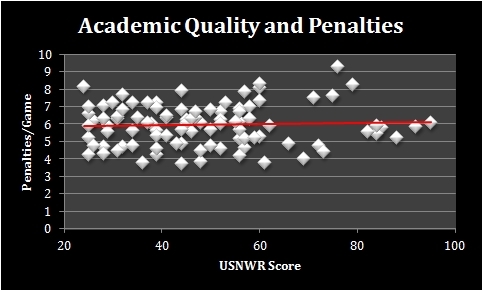 In addition, USNWR does not give specific scores to any school earning a value below 25 on their 100 point scale. I have also excluded them from the analysis below. Second, and perhaps more difficult, is that we need a way to measure mental mistake propensity. I can conceptualize “mistakes” in a variety of ways, but the trouble is hammering out something that is (1) somewhat objective and (2) quantitatively available. Penalties seem like an appropriate choice because they are (usually) mistakes and often leave everyone shaking their heads. If these elite schools really have their academic prowess rub off on football players, we would expect them to incur fewer penalties. It’s not the same type of mental mistake that occurred during the UCLA/Stanford game, but it’s a decent substitute. Both of those red trendlines are as flat as they get. There simply is no relationship. And why would there be? Football is specialized knowledge. Players are recruited for that knowledge, not their ability to master biochemistry. And biochemistry is not going to teach you whether grabbing an opponent’s face mask is appropriate behavior. In sum, unless penalties are a poor way to measure mistakes, academic prowess has nothing to do with football IQ. What we have here is a case of commentators filling airtime with silly platitudes. Which is obviously superior based on the #1 school on that list. The real concern here—as any game theorist would love to point out—is that penalties aren’t really against the rules so much as an alternative way of playing the game. For example, if an offensive lineman is beat off the snap has the choice between giving up a 10 yard holding penalty and having the quarterback be sacked for a loss of 12 yards, the “penalty” really isn’t much of a penalty at all. While I don’t discount that intentional penalties occur and are the result of smart play, these seem to be the exception to rule. Indeed, we rarely hear of penalties as being a good thing, and when we do, it’s precisely because it is so rare. For the statistically inclined, here is the regression output for penalty yards per game using OLS. I didn’t control for anything else, and I’m not sure there is anything to control for here anyway. Let me know if I’m wrong in the comments. The observations deleted due to missingness are the schools that lack a USNWR score on the national universities list.